The World Wide Web may be based here on Earth, but it can give you a bird's-eye view of the rest of the universe. WikiSky is a stellar place to start stargazing. Its gorgeous images of comets, galaxies and nebula  many of which come from the NASA-funded Astrophysics Data System at the Harvard-Smithsonian Center for Astrophysics  are accompanied by short scientific explanations that will delight astronomy buffs. 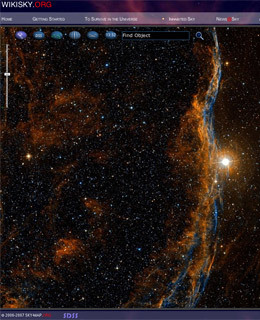 For a different lens on most objects, click on the Sloan Digital Sky Survey, which gives you the most realistic, high-res images of the night sky. The publicly and privately funded project, which aims to eventually map about a million galaxies and quasars, uses a massive telescope in Apache Point, N.M., and a 120-megapixel camera to capture its images. For breaking space news and more photos, visit Space.com. To the moon!